Last Sunday, we celebrated a meaningful “Yom Yisrael” (Israel Day). JOLI helped plan the day and run the different peulot (activities). Each edah focused on a different aspects of Israeli culture and history. The Ilanot chalutzim had activities relating to raising kids in Israeli society via life milestones such as birthday parties, bnai mitzvah, entering the army, and more. Metaylim and Sollelim together learned about pioneer spirit of the early chalutzim (pioneers) and the establishment of the State of Israel. The Bogrim chalutzim focused on issues about Israeli innovation and contributions to the world. 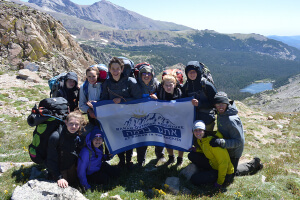 Ilanot had a week full of base camp activities, as well as a camp-out out under the stars. One of the highlights of their week was Rocktion. At the Rocktion (Rock-Auction), the campers collected rocks around camp that they would try to “sell” to staff and fellow campers, in exchange for popcorn kernel currency. The chalutzim created their own pricing system based on what value they found each rock to be worth. Dani, the Rosh Edah, excitedly shared with me about a moment where four campers pooled their rock resources and created a “store” together at the Rocktion. Other activities included a carnival complete with face painting, balloon animals, a photo booth, snow cones as well as a hike up one of our neighboring mountains. Metaylim spent some time in base camp this week along with time out on a 2-day backpacking masa (backcountry excursion). One of the highlights of their week was a limmud (learning activity) where Nadav (a staff member) led them in a discussion about changes that campers would want to see in the world. These campers maturely and articulately discussed in small groups their personal passions: gender equality, religious ethics, gun control, and many other worldly topics. Campers had a lot of curiosity to learn and understand more. They shared their own opinions on the topics, how they think it affects their day-to-day, and how they can support each other’s beliefs. 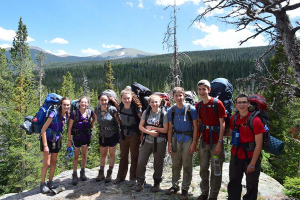 For the final three days of the week, the group backpacked in Pike National Forest. One masa group shared that they encountered unexpected items on the trail including a cave in one spot, some animal bones in another, and more! The kids came back covered in charcoal “war paint” excited about their accomplishments and ready to celebrate Shabbat! Sollelim spent the majority of this past week out on masa. Groups were spread across Western Central Colorado including groups who rock climbed near Canyon City, shot archery at Cheyenne Mountain State Park and biked in Pike National Forest. The biking trip left camp and returned four days later after biking numerous mountain passes and having ridden 37 miles just yesterday! The art masa, one of our newer additions, had a chance to hike and paint in the beautiful Colorado wilderness. This past Shabbat, Bogrim did a Peulat Shabbat (Shabbat Activity) on Jewish Identity. The edah made bar graphs by voting with post-its on various important aspects of our Jewish identities. Categories included Israel, Hebrew, Jewish Education, having Jewish friends, pursuing social justice, Shabbat, Jewish observance/halakhah, eating Jewish foods, and remembering the Holocaust. The campers made new bar graphs of what our grandparents would have chosen within these categories. It was interesting to see trends of what chalutzim chose and similarities and differences to their grandparents. The discussion then moved into smaller groups based on the category and everyone shared stories of why they chose it. One chalutzah told the story of her grandma, a Holocaust survivor in Toronto, and how that has impacted her Jewish identity. Bogrim left camp on Monday morning for their various masa’ot. This summer we pioneered the advanced climbing/mountaineering chug in basecamp, which pairs up with a mountaineering masa. We created this program to give campers who had been here for a number of years a new opportunity to grow and challenge themselves. In the same day on masa, that trip managed to go sledding down a patch of ice, cross over the Continental Divide, and spend the day swimming at an alpine lake (at 10,000 feet) in Rocky Mountain National Park! The participants on this new masa had a great time. They even said it could be harder so as to be able to push themselves more next time. JOLI has been gone since early Monday morning, and experienced some incredible moments and achievements on “adventure masa”. While the majority of the edah was out on the masa, several chalutzim chose instead to be counselors-in-training (CITs) in different areas around camp, and learn more about what it means to be on staff. On the adventure masa, the chalutzim got to mountain bike, rock climb, hike, and even practice their WFA skills! Their madrichim (counselors) ran them through several medical scenarios to test their training on the trip. Yesterday, the group reached the summit of a high peak nearby, and were exceptionally proud of their accomplishments on the trip. Ari, our Communications Manager, joined them for two nights, and shared that he had many incredible conversations with this thoughtful and mature group of campers about their JOLI experience, school, hobbies, life, and how they got to Ramah. He appreciated watching the intentionality of every component of the trip and how much responsibility the chalutzim had to lead themselves throughout. As we get ready to send this email, everyone is showering and changing into their clean white clothes. We are going to be gathering in a few minutes in the Pardes T’fillah for dancing and Kabbalat Shabbat. It is hard to believe that this is the final Shabbat of first session. Our time together has been flown by. Tonight, in my D’Var Torah, I will be emphasizing the importance of cultivating friendships that last a lifetime. Indeed, we have seen that many of our chalutzim who have been with us for multiple years are forming and nurturing these friendships and our hope is that, over time, as our younger chalutzim return to camp each year, they too will have these cherished friendships on which they can rely.